But launch was just the beginning for Sea of Thieves. In April we shared how we intend to evolve and grow the game after launch, and delivered the first of three summer updates with the release of The Hungering Deep on May 29. We absolutely loved seeing the stories coming out from players’ adventures with this release, from the player who used the speaking trumpet as a tannoy system, through to the incredible camerawork on display here, and a fitting end for Megan herself. For this year’s E3, we’re pleased to be able to give fans a taste of what’s to come with a new teaser trailer for the next two Content Updates due to hit in the coming months; Cursed Sails and Forsaken Shores. Releasing in July, Cursed Sails will bring a new threat to the seas in the form of terrifying skeleton ships. We will be introducing these to the world by way of a time-limited campaign, providing a new threat and challenge for players to take on for exclusive rewards. Beyond this, they will remain as emergent threats in the world for players to take on. We are also introducing a new ship type – the Brigantine – for up to three players to adventure on. This is the first new ship players will be able to get their hands on, and we are committed to continuing to expand the Sea of Thieves fleet. In September, Forsaken Shores will reveal a new part of the world that will test the skill and nerve of even the most hardened crews. This is a volcanic area, and any crews setting sail into this part of the Sea of Thieves will be committing to an arduous, difficult voyage filled with danger. Rocks will rain down from the skies, the seas will be rough and every adventure will be fraught with peril. Accompanying this, we are also introducing a Row Boat for players to use, supporting them in navigating this perilous new world. 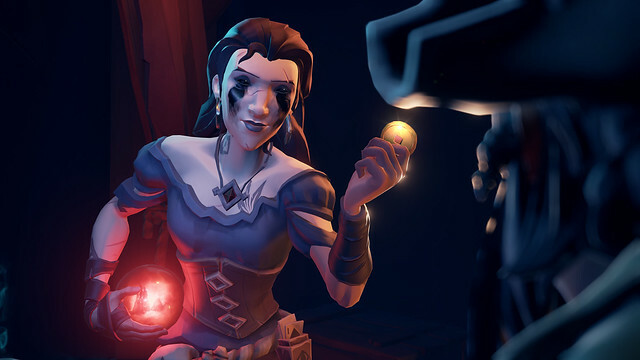 Before all that though, we will be beginning our regular in-game events on June 12, when we introduce the time-limited Skeleton Thrones event to Sea of Thieves. The events will give players new goals and rewards on a regular basis, outside of our Content Updates and the time-limited campaigns that accompany them. We are thoroughly excited to get the first of these into players hands soon! Thanks to everyone for their support so far. Sea of Thieves has had an incredible launch, and we’re really now embarking on our post-launch adventure. It’s going to be a lot of fun!